The powder room, often one of the last areas of the home to be decorated. And why not, there are spaces in your home that you certainly spend more time in. Areas like your living room and master bedroom are often addressed first and foremost from paint to furnishings. Of course, these are great settings for a custom wallpaper project or wall mural, but the powder room offers an interesting set of challenges as well as rewards. First of all, most powder rooms are often tight, smaller rooms. Also, the powder room is most frequently visited by guests. Due to their cramped size and the homeowners lack of presence, the powder room lingers with paint form the time of construction, perhaps adorned with a random bauble here or there. Many a powder room has been relegated to the nautical theme without a second thought. A custom wallpaper installation from www.greatwallonline.com can address the afore mentioned problems. The first issue: small room size. This is a great reason to use custom wallpaper, create a bold and exciting pattern. This could become overwhelming in a larger space, but the limited space of a powder room can reign in even the most complicated pattern. Additionally, a larger scale print or pattern can offset the feeling of lack of space in a small room. Only guests use the powder room: what a perfect excuse to really wow your friends and family. A custom wall mural is unexpected, and the powder room an unexpected place to find one. A powder room decorated to the nines represents a home that is well polished and complete. 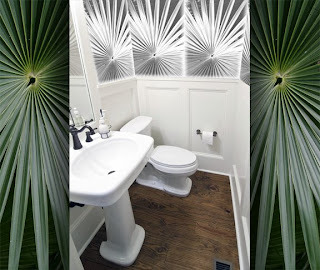 The image above illustrates such a powder room custom wallpaper solution. The original image used to create the wallpaper design was a vacation photo from Key West of a palm at the Botanical Garden. The image was rotated and cropped, and converted to black and white. To soften the seems of the pattern repeat, a slight glow was added to the perimeter of each section. The star burst like effect of the palm repeating gives the custom wallpaper an art deco feel. The scale of each palm is the pattern is large, reaching from the chair rail molding to the ceiling, creating a larger than life presence of the wallpaper. Finally, the overall wallpaper was slightly washed out to compliment the crispness and cleanness of this traditional white powder room. The final effect is a powder room that clearly represents a tropical theme or affinity, but in a subdued, sophisticated way. Clearly this powder room is able to compete for the same level of attention as the more traditionally well-appointed rooms. Is your powder room ready for its transformation? Visit Great Wall Custom Coverings to begin your custom wallpaper project!